Despite how many excellent products come out of Japan and other parts of the world, there is a certain mystique and esteem that comes with the “Swiss Made” label. Unfortunately, purchasing a timepiece from Switzerland often comes with a price tag of over $1,000. 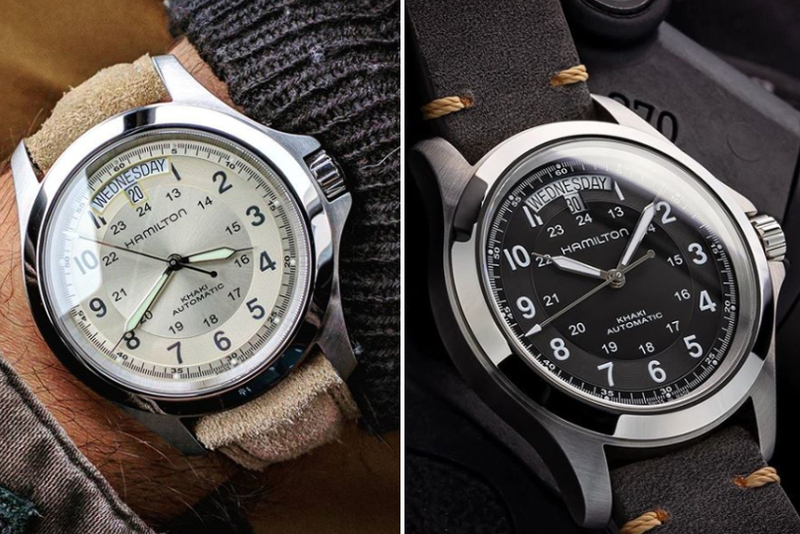 The good news for collectors on a budget is that there is an excellent piece from this part of the world that won’t break the bank: The Hamilton Khaki King. I tell you everything you need to know about this watch in the sections below. Though modern horology enthusiasts know Hamilton as a Swiss brand, it was founded in the United States around the beginning of the 20th century. One of the great things about a brand with a long history is that they have legitimate heritage. 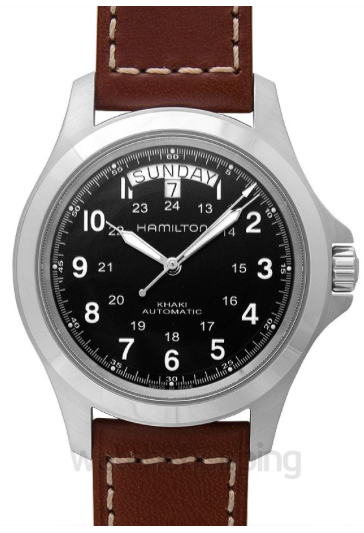 For example, Hamilton supplied watches to the United States Army during WWII, which is a nifty slice of history that you can wear on your wrist. The Swatch Group, a parent company that owns many brands, bought Hamilton in the 1980s. While this action took a premier company off US soil, every watch from this company is now made in Switzerland, which is widely regarded as the timepiece capital of the world. Though it may come in other sizes, the standard diameter of this piece of 40mm. What I like about this size is that it isn’t too big or too small. Watches that get over 45mm start to be a bit gaudy, while tiny ones also look tacky on larger wrists. The Khaki King is right in the middle, making it more attractive than most other options. It is a bit thick, coming in at 11mm, but most will not mind that fact. Overall, the sizing on this piece is just about perfect. What you think about the aesthetics of the Khaki King will come down to your personal preference. For me, I love its rare combination of function and elegance. First, it gives you a wide array of information, like the day, the date, a 24-hour clock, and more. While all that could lead to a crowded and jumbled dial, Hamilton manages to give it a luxurious look with the simple combination of black, white, and silver coloring. While those that demand a true minimalist style won’t love the look of this piece, most can agree that it is quite beautiful. While its 50m water resistance isn’t very impressive, Hamilton didn’t build this watch to be a diver. Instead, they sought to make a piece that is luxurious and well made for those of us that prefer to stay on land. The result is a watch that almost anyone can recognize as high quality. The case feels sturdy in your hands, the crystal is made from resilient sapphire, and the leather strap is top of the line. Overall, this piece is made from excellent materials and is tough enough to last you many years. The Khaki King uses the famous Swiss ETA Caliber 2834-2 automatic movement. Though Hamilton does not build it in-house like more expensive brands do, this piece of machinery has an excellent reputation in the horology community. It has a 38-hour power reserve, only 5-15 seconds of error throughout the day, and is conveniently automatic. One of the most challenging parts of reviewing watches is describing how it feels on your wrist. The reason is that the factors that make up this assessment are not apparent. Most likely, it is some combination of size, weight, comfort, and materials. Regardless, this piece wears well. It is very comfortable, not too heavy, and feels great on your wrist throughout the day. Though prices vary, you shouldn’t pay more than $500 for a Khaki King. This relatively low cost is one of the primary appeals of making a purchase. You can get a piece with excellent hardware and heritage, and not have to take out a second mortgage to do it. There may be no better way to break into the Swiss market than buying this watch. My final verdict on this watch is overwhelmingly positive. My favorite tests for grading timepieces are looking at heritage, size, aesthetics, toughness, movement, wear ability, and price. What I can confidently say about the Khaki King is that it passes every test with flying colors. There are two negative things I will say about it, though. The first is that the dial has a ton of information on it, which could put you off if you like a simpler look. The second is that you might be able to get similar quality out of a Japanese brand for a bit less money. All that being said, I researched this watch heavily, made the decision to purchase it, and definitely don’t regret it. The overwhelming odds are that you’ll feel the same way if you make a purchase of your own.